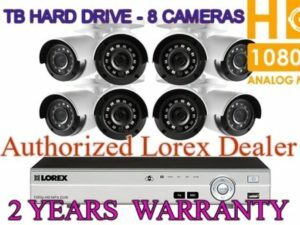 Secure your business or commercial property with confidence by owning this 22 camera surveillance solution from Lorex. 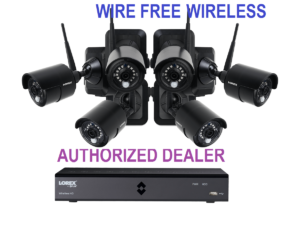 Starting with our top-of-the-line 32-channel NR900 Series network video recorder (NVR), this system also comes with twelve bullet and ten dome security cameras. Belonging to our brand new Nocturnal product line, these cameras offer 4K recording resolution, the longest night vision ranges available, and extreme weather resilience. That is not all, though. Both of these cameras offer something special. The dome cameras, for instance, come with a built-in microphone for listen-in audio capabilities while the bullet cameras come with a 4× optical zoom lens that lets it remotely zoom in and out. There’s even room to accommodate ten additional IP cameras using the included PoE switch. 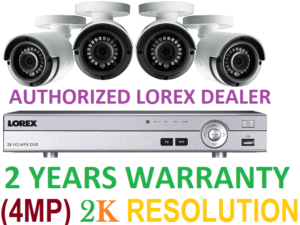 Choose from any IP security cameras – from 1080p all the way to up to 4K security cameras. Generally speaking, security cameras are meant to capture important evidence should something happen on your property. That is why every Nocturnal security camera in this system contains an 8.51 MP image sensor that is capable of recording 4K resolution video. This sensor will provide you with exceptionally sharp video that will give you the best chance to capture the distinct details that you need. A 4K camera records over six million more pixels than a 1080p security camera. That’s 4× the amount of pixels! With this higher pixel count, you can expect a much higher quality of video, with sharp definitive lines that distinctly outline every object and feature. Another benefit of a 4K security camera is that details will remain legible for longer as you digitally zoom in to your footage. This makes 4K resolution especially important for security purposes. The bullet cameras in this bundle offer the longest night vision range available. With the help of some ambient lighting, the night vison range can reach up to a remarkable 250ft! The domes also have an incredible night vision range up to 200ft. 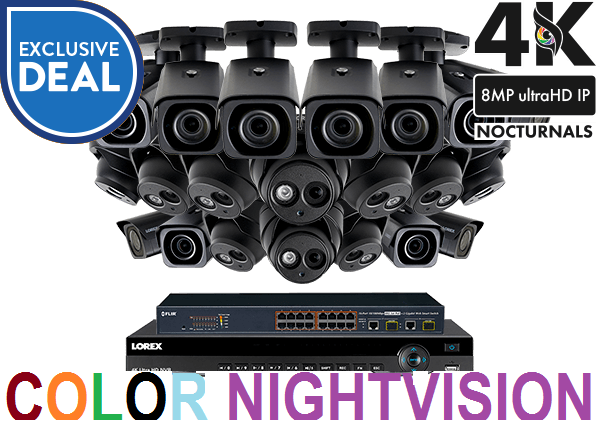 These Nocturnal security cameras also include our revolutionary Color Night Vision technology. By adding external lighting, such as a porch light, your cameras will record in color, even in the dark. This will add a whole new layer of details to your night vision. Your Nocturnal security cameras use an incredibly sophisticated Sony Exmor R™ image sensor. This type of sensor is especially useful for security cameras because of its amazing low-light performance. It uses back illuminated technology to capture more light, as the incoming light bypasses the normal layer of metal wiring and transistors that can diminish the amount of light with front illuminated image sensors. This sensor also shields the video from low-light noise / grain by passing the signal through an analog noise reduction program before converting the video signal to digital and a secondary noise reduction after conversion. It is important for a security camera to replicate colors as accurately as possible. Thankfully, there is an active mechanical lens filter, or an IR cut filter, that blocks the infrared lights emitted by your cameras from entering the lens during the day. This ensures that this type of light does not discolor the video. This filter will then automatically disengage when night falls to allow the infrared light back in. Nocturnal cameras can record 4K resolution video at 15 FPS (frames-per-second). They can also record at a real-time 30 FPS rate in 2K resolution. A 30 frames-per-second recording rate will provide you with real-time on-screen movement, and grant you with more frames to choose from when cycling through footage. All of the included security cameras use an HDR (High Dynamic Range) feature that works to ensure that you can see clear details in all sections of the video, regardless of lighting conditions. This feature will automatically adjust the brightness of the video in both bright and dark areas of the video so you will always see the details you need. Both sets of cameras use 3D-DNR (Digital Noise Reduction) technology to filter out noise / grain from scenes with low-light. It will also do its best to remove any noise caused by motion. This will provide a cleaner, more accurate image with better clarity, sharpness, and improved motion detection. It will also reduce video file sizes as well, giving you greater disc space for storage. The listen-in audio capability of your dome security cameras will add a further layer of security coverage. * This will provide additional details (such as voices) and help detect and interpret events (even if they occur off-screen). The bullet security cameras featured in this bundle contain a motorized varifocal lens. This lens features a 4x optical zoom and allows you to customize your viewing area and focus. Zoom all the way in to a 39° horizontal field of view (FOV) to view a small area in close-up detail or all the way out to a wide 102° horizontal FOV to maximize your coverage. Make these adjustments using your Lorex NVR, or a connected mobile device. IP67 rated, your security cameras can persevere through the worst types of weather – they will even continue to operate in extreme temperatures as low as -22°F (-30°C) to ensure year-round security that never stops working. Both sets of cameras are housed in aerospace-grade aluminum that can last for years and years (even if they are directly exposed to intense weather conditions). Connect your NVR to our FLIR Secure™ app for easy remote monitoring and more. This easy-to-use app allows you to view live and recorded video from your security cameras on your smartphone or tablet for peace of mind no matter where in the world you are (you can also use a web browser on your PC or Mac computer to access your security cameras through the FLIR Secure™; web viewing portal). This app will also enable convenient push notifications for motion-triggered events so you can always be in-the-know. Other app features include free cloud storage, RapidRecap®, and (for the first time on NVR security recorders) a privacy mode that allows you to easily turn off and on the recording of a camera straight from your phone. Use the FLIR Secure app to create a RapidRecap® video. This feature will let you see more while watching less by compiling up to 12 hours’ worth of activity into a short video summary. Watch as all motion events are superimposed onto your screen simultaneously with accurate timestamping to tell you what happened and when. 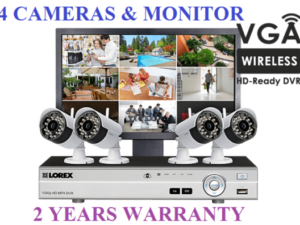 A free Lorex Cloud Basic plan is included with this security camera system. This basic plan includes limited cloud storage, cloud history, and RapidRecap videos for one camera (defaulted to channel 1). Upgrade this plan to a Lorex Cloud Premium plan for 30 days of cloud history, unlimited cloud storage, and unlimited RapidRecap videos. IP security systems such as this feature a simplified installation thanks to Power-over-Ethernet technology. Each camera only requires a single ethernet cable to connect it to your NVR. This cable provides power to the camera and video / audio transmission up to 300ft / 91m. How do I use all 32 channels on my NVR? The 32 channel NR900 Series NVR supports up to 32 security cameras but only has 16 built-in PoE ports on its back side. This is why a PoE switch has been included in this system. By connecting this PoE switch to your system you can accommodate the rest of your security cameras. A PoE switch also opens up the possibility to have your security cameras up to 600ft away from the NVR. Learn more about PoE switches here. Safely store recorded security footage onto the massive 6TB security certified hard drive within the NR900. Not your ordinary hard drive, this HDD is engineered to be in the constant operation and can even continue to record while you watch recorded footage. A secondary hard drive bay is also available within this NVR. This allows you to add another hard drive up to 6TBs. Customize the record settings on each camera to suit your needs. Choose to record footage continuously, during scheduled times, or when movement is detected. Motion recordings include a pre-recording function that will record the five seconds before the motion is even detected, ensuring you never miss a moment. Both sets of cameras and the NVR included here use HEVC compression technology. HEVC stands for High Efficiency Video Compression (also known as H.265 or MPEG-H Part 2), and is used to compress video file sizes without any noticeable difference in quality. This lets you keep the 4K footage without the 4K file sizes. It will also let you watch the highest quality security footage while you are away from your home or business without large data transfers. Create up to four custom motion zones with each camera. These zones can be programmed to adjust both the sensitivity (the amount of movement required to register that movement) and threshold (how much movement is required before creating a motion “event”) for motion detection in different areas of the camera’s field of view. You can use your NVR to mask out sections of a camera’s field of view that you do not wish to be recorded. Simply draw a square or rectangle over these areas. Your NVR will automatically update its firmware to the latest available version as long as it is connected to the internet. This will make sure that your NVR is always up-to-date and protected from any new vulnerabilities.